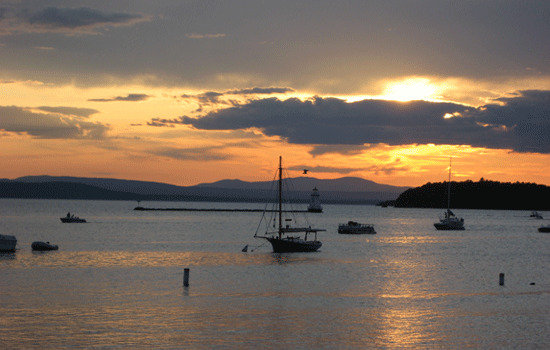 Lake Champlain is a sailor's paradise. Named after the French explorer Samuel de Champlain, it is near the Canadian border in the northern United States and is surrounded on either side by Vermont and New York States. The lake's elongated shape, and deep waters make it perfect for long leisurely sails. It offers endless sailing opportunities. It features over 70 islands, from oversized rocks to some as large as 21 km. The deepest portion, a 122m trench, is located at mid-lake between Charlotte, Vermont and Essex, New York. Imagine yourself sailing on a beautiful day, the Green Mountains on the east side and the Adirondacks on the west. You might think you are on the serene alpine lake, but you are enjoying all the fun and challenge of sailing on a large body of water. In the evening enjoy breath-taking mountain views while relaxing at one of the many safe anchorages such as Deep Bay, Partridge Harbor, Mallet's Bay and Converse Bay. Want to stretch your legs? Much of the shoreline remains undeveloped and its many marine and nature parks are perfect for a bit of hiking or nature watching. For those wanting more activity or simply to re-provision, just ease into one of the well-appointed marinas through the marked channels and treat yourself by visiting one of the many towns that line the lake. If you also love fishing, then the lower lake area from Whitehall and to the north of the Crown Point Bridge is for you. The river like conditions, cloudy waters and marsh lined shores are a perfect playground for fishing. LAKE CHAMPLAIN BAREBOAT CHARTERS - The ultimate in privacy & freedom, bareboat rentals are for groups having their own qualified skipper. Hiring a captain and or hostess/cook always remains an option. For a list of our available Bareboat yachts, please Click Here. This long-awaited marina is not only our new home, but the city of Plattsburgh has also entrusted us with its management. This is great news for us but even more for you as we can finally offer you the top quality marina services you've come to expect. Because it is centrally located, you are now free to decide in which direction to travel based on the weather and wind predictions. It is centrally located in Plattsburgh, so you'll have lots of amenities at your disposal during your stay at the marina: restaurants, bars, boutiques, nature trails, parks, golf courses, museums and historic sites. And of course, you'll have easy access to all you need to provision your boat before departure; grocery store, pharmacy, and liquor stores. Vacation and learn to sail at the same time one a fun-filled week of cruising Lake Champlain under the friendly guidance of your own U.S. Coast Guard licensed sailing instructor. You'll learn the difference between a sheet and a halyard, practice basic navigation among a chain of glittering islands, review anchoring techniques as you stop mid-day to explore an undersea coral garden, master docking at a fine marina for dinner and dancing, and maybe even touch on celestial navigation as you stargaze from your boat, anchored in a moonlit cove. For more information, please ask one of our travel consultants for details.